Because sound is such an important part of our lives, it is important that you are able to hear the world around you clearly and without ringing or feedback. If your otherwise dependable hearing aid is now failing to provide you with high quality sound and assistance, it may be time to switch to an upgraded device. Because sound is such an important part of our lives, it is important that you are able to hear the world around you clearly and without ringing or feedback. However if you are wondering about whether or not a tech upgrade is necessary for you, consider the following factors in order to determine the right timing, as well as the right technology for you and your lifestyle. No matter the rate at which your hearing loss is advancing, your hearing loss should not be noticeable or worsening with the help of your hearing aid. 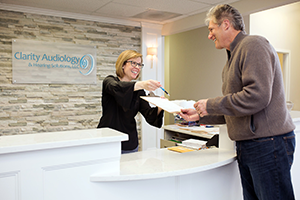 If you are not struggling to hear the sounds that you once could with your hearing aid, it may be time to meet with your audiologist to see whether or not your hearing loss has advanced. With this, you may be required to upgrade your hearing aid sooner, or have your device professionally adjusted so that you are able to hear sounds clearly again. Lifestyle changes, such as a new home, job, or hobby, may also affect your choice of technology with your new or current hearing aid. These new changes or additions to your life may require you to upgrade your hearing aid to technology that is more suitable for your new lifestyle. If you recently moved to a city, or recently started a new activity such as biking, you would then need to change your hearing aid to something that may be more comfortable for those new conditions. If the technology in your hearing aid is older and less advanced, it may be time to upgrade to a newer device. An upgraded device may offer you additional comfort or high quality sound that will better enable you to hear in a variety of settings and activities. If you are unsure about switching to the latest technology, it is best to ask your audiologist so that they can recommend the best hearing aid for you based on your needs. This entry was posted on Thursday, May 24th, 2018 at 10:51 am. Both comments and pings are currently closed.